Acorn Hill Academy: Motivated Moms Mother's Day Sale! 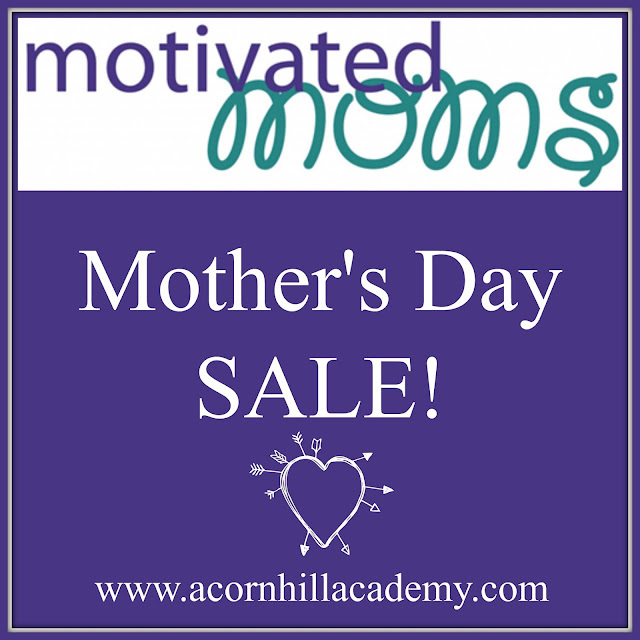 Motivated Moms Mother's Day Sale! It's really no secret that I am, as my friend Tauna puts it, "domestically challenged." I can clean really well, but there's a lot of clutter around here, so cleaning anything takes longer than it needs to because of all the picking up that has to happen first. Can anyone else identify with this scenario? A few years ago, I learned of the Motivated Moms planner, and it has changed my life for the better. It started out as a printable ebook, and now they have both Apple and Android apps, too. What is Motivated Moms? Well, let me tell you a bit about it. It's a daily list of tasks to help keep you on track with your home. There are daily tasks, weekly tasks, monthly tasks, and annual tasks. If you complete the lists every day, you will find your house takes shape fairly quickly and stays that way. There are things on the list that I would never think to do without a reminder - like cleaning the globes on ceiling fan light fixtures. I used to prefer the printable planner, because I like having the visual reference right in front of me. Unfortunately, it was easy for me to misplace it. I would move it, or someone else would, and it just didn't stay front-and-center as I'd hoped. I was resistant to the idea of depending on an app, but once everyone got used to it, I found it worked really well. Another nice feature of the app is, if you don't happen to complete a day's list, the next day's list appears the following morning. There is no guilt! I do try hard to get my lists done, but it doesn't always happen. Just keeping it real here, folks. 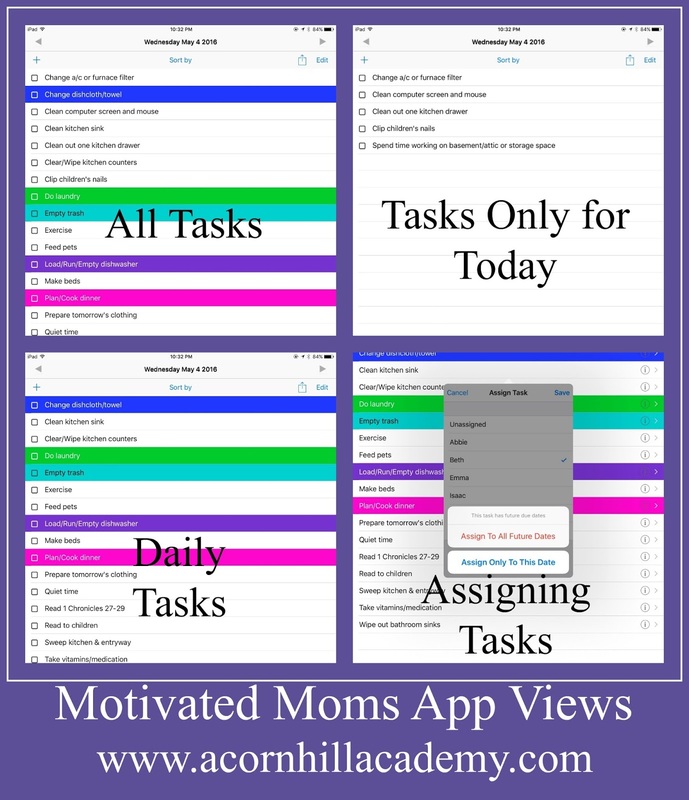 The best thing about the Motivated Moms planner is that it really helps keep me on track throughout the day. I am easily distracted. I might go to start a load of laundry, see that a cat threw up somewhere along the way, stop to clean that up, realize I should really vacuum the entire floor, see the shoes someone left out that should be put away... and then realize, after all that, I never did start the laundry! I'm also prone to being in a muddle, as my mom likes to say; at loose ends, so to speak. If I find myself unsure of what I should be doing next, I just pull up my task list. The best news? The annual Mother's Day sale is happening RIGHT NOW! From today, May 5, through Monday, May 9, all MoMo products are 50% off! Please note that the free ebook offer is only valid when the subscription is purchased through the Motivated Moms website. It won't work if with in-app purchased. If you already have an app subscription, purchasing now will add a year to whatever you currently have. I really, really love the Motivated Moms planner. I hope you will check it out, if you're looking for something to help you manage your time better during your days. I can certainly use all the help I can get, and I appreciate the good habits my MoMo app is helping me develop. Disclaimer: I received a free year's app subscription in exchange for offering my honest review.